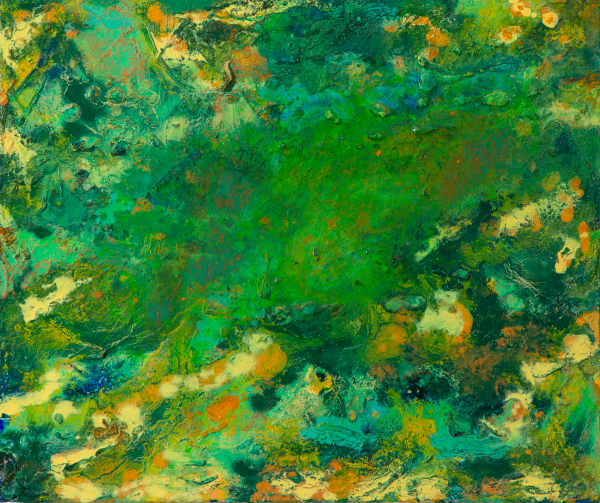 Ellen Woods’s lyrical abstract paintings are inspired by her deep respect for the natural environment and the human connection to nature. Living and working at a high altitude in the Rocky Mountains of Colorado allows her to witness seasonal patterns and forms and the evolving topography. When speaking of her work she states, “My concentration is the changing seasons and the cyclical aspects of life including birth, growth, decay, and renewal.” Her website features paintings that reflect these experiences, plus a new series of spirited prints. 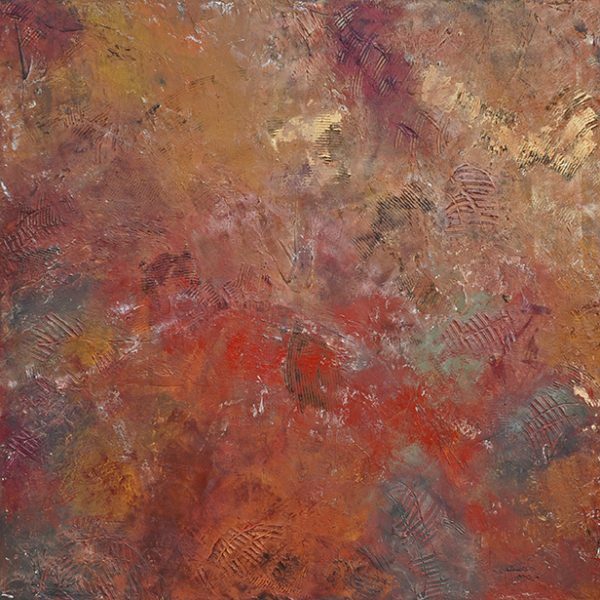 A physical process that is both additive and reductive, in search of a cohesive poetic composition, guides her creative expression: “My paintings go through generative and destructive phases, changing forms many times by dynamically layering, scraping, spraying, and splashing paint repeatedly.” The results are rich weathered textural surfaces, often embossed with various organic matter pressed into the wet paint, as well as brushes, scrapers, and squeegees, as can be seen in “Ancient Rocks.” It’s no coincidence that her process parallels a pattern similar to the way nature changes over time. Woods has a masterful sense of color and uses it sparingly in many of these nature abstractions. 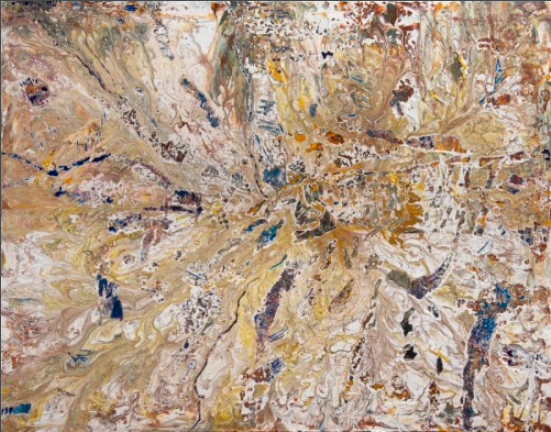 Each composition is based on her observation of light, on its patterns and textures in her immediate environment. She applies only enough color to establish mood—in “Winter Hike” she sets the extreme dark and light parameters against white and scattered contrasting darker blue. In between is a family of warm pale yellow, ochre, and tans that reveal the dry earth beneath the snow. Her new paintings celebrate her command of color, with their sharply increased intensity. They seem to be more about an artistic statement than subtly capturing a particular time and place. “Nature Elements” exemplifies an increased dark-and-light patterning in her compositions, and more gestural brushwork. 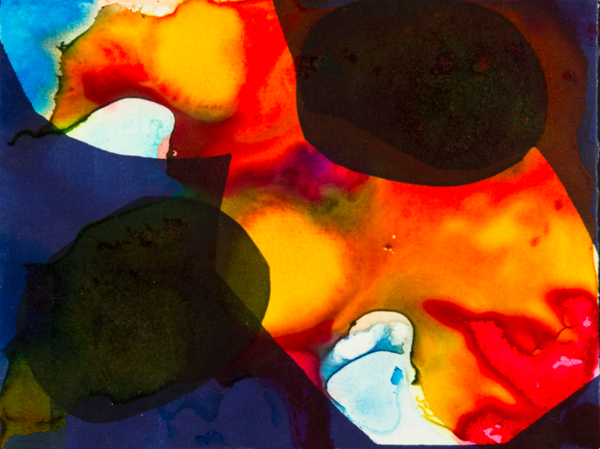 When I navigated to New Prints on her site, “Metamorphosis” jumped out in a blaze of orange, yellow, and black, and with a new atmospheric depth. This series is diametrically opposed to her painting, and I admire both. I can’t help but wonder what prompted this work? Sometimes an artist just wants to try something new and explore what happens. Sometimes changing medium forces you to think differently. Whatever the reason, I applaud Ellen Woods’s bravery and look forward to see how all of this develops.